Cook County State's Attorney Anita Alvarez (r.) recused herself from the trial of Chicago Police Officer Jason Van Dyke (l.), who faces murder charges in the shooting of Laquan McDonald. COOK COUNTY CRIMINAL COURTHOUSE — In a surprise move, Cook County State's Attorney Anita Alvarez on Thursday announced she would recuse herself from the case against the Chicago Police officer accused of killing Laquan McDonald in 2014. During Officer Jason Van Dyke's Thursday court appearance, prosecutors asked to be removed from the case and have a special prosecutor appointed — saying the move was in response to two requests from the public for Alvarez to step down from the case. In a court filing, Alvarez maintained there was no conflict of interest for her to handle the prosecution of Van Dyke, 38. "Nevertheless, because the primary goal of State's Attorney Alvarez is, and has always been, to obtain justice for Laquan McDonald, and ensure continuity in the handling of this important and complicated case, State's Attorney Alvarez has elected to recuse herself and her assistants from this matter ..." Alvarez said in her filing. Cook County Judge Vincent Gaughan said he wanted time to consider the request, and set another hearing on the matter for June 2. "Quite frankly, this was unexpected," said Locke Bowman, one of the attorneys who initially called on Alvarez to hand the case over to a special prosecutor. "It is most definitely the right thing to do. ... This prosecution needs to be handled superbly." Alvarez in a statement Thursday said: "While it is has not been an easy decision, I believe that it is the right one because it will help to avoid unnecessary legal delays and provide continuity in the handling of this very important and complicated case. It would also ensure that one designated prosecutor will handle this case as it proceeds to trial." The move came during a hearing in which Van Dyke's lawyer argued the officer should be allowed to skip some future court hearings out of fear for his safety. Defense attorney Dan Herbert in March asked Gaughan to waive Van Dyke's presence at routine appearances, claiming Van Dyke has been shoved, harassed, threatened and called "white devil" as he's entered and exited the Leighton Criminal Courthouse, 2600 S. California Ave., in recent months. On Thursday, Herbert said Van Dyke's father has been assaulted going in and out of the courthouse at previous hearings, and once again said Van Dyke has been subject to death threats. Prosecutors in court filings argued that such a move might look like preferential treatment and set a bad precedent, the Tribune reported. Van Dyke could be accompanied by extra deputies, prosecutors suggested, or enter the courthouse before it opens to the public. Gaughan on Thursday said he felt the security plan in place for Van Dyke's hearings was adequate, and held off on ruling on Herbert's request. No protesters were present for the hearing Thursday. "Today and the last court date, I didn't see any protestors," Herbert told reporters after court. "But the threats have been pretty direct, and they've been quite serious." Herbert said he is still "very concerned" about security and would've liked Van Dyke to be able to enter and exit the courthouse through a side entrance, at the very least. "I would like as much security as possible," Herbert said. "This case — whether or not there were protesters here at the last court date — we know there's going to be a significant amount of public outcry and protesters when we get closer to trial." Van Dyke is free on $1.5 million bond as he awaits trial on murder charges in the death of McDonald, 17. McDonald had been stealing car radios and was armed with a 3-inch blade when Chicago Police officers in Archer Heights called in a radio request for a Taser on Oct. 20, 2014, prosecutors have said. Van Dyke and his partner responded to the call, but never specified whether they had a Taser. Within seconds of arriving on the scene, Van Dyke pulled his gun and emptied his clip into McDonald, shooting the teen 16 times, according to authorities. Video of the shooting, which was released via a court order in November 2015, sparked citywide protests that shut down the Mag Mile. Herbert has said he might try to move Van Dyke's trial out of Cook County because it could be hard to find an impartial jury here. In February, a coalition of activists, including Bowman, filed a petition asking for a special prosecutor in Van Dyke's case. The group alleged that Alvarez couldn't be trusted because she has a "political alliance with the police union." Alvarez lost her bid for re-election in March, garnering only 33 percent of the vote, compared to Kim Foxx's 52 percent, according to the Cook County Clerk's website. Many attribute the heavy loss to how Alvarez handled the McDonald case, including her nearly 400-day delay in filing charges against Van Dyke. 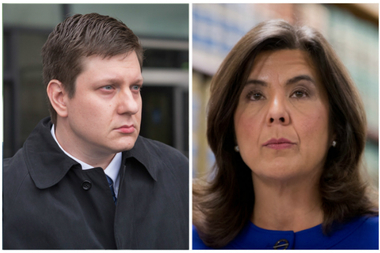 Anti-Alvarez activists campaigned for Foxx, and the hashtag #byeanita took off on social media on election night.